Lawnboy lawn mowers have a long and colorful history in the USA. The company traces its roots to at least 1934, when the first motorized lawn mower was manufactured by the company that would later be known as Lawnboy. Following WWII, the company began manufacturing rotary lawn mowers. Their signature 2 cycle engine became mass produced in 1970. Featuring only 3 moving parts, this engine delivered more power and less weight than its 4 cycle counterparts. The 2 cycle engine was recently abandoned due to emission control concerns. In 1989, Toro purchased the Lawnboy company. Lawnboy offers a variety of model classes to satisfy consumer needs. A base model is offered through home improvement stores, as well as more feature laden versions sold though established dealer networks. The lowest priced Lawnboy mower is sold though Home Depot. A side valve 4 cycle Briggs and Stratton engine is mounted on a stamped steel deck. Rear wheel drive self propel is an option, and variable speed is available. The Insight series are sold through dealer networks. This is a more expensive mower, which features an ergonomic handle, and is either push, variable speed self propel, or the Lawnboy Sens-A-Speed system which adjusts the speed to match the operator’s pace. A side valve Briggs and Stratton engine is standard. The added features increase the price of this series, with the range of $380.00 to $500.00 depending on the options present. Top of the line is the Insight Platinum . 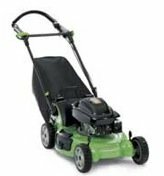 Powered by an optional Honda overhead valve (OHV) 4 cycle engine or a side valve Briggs and Stratton 4 cycle engine, this mower has almost any feature the discriminating buyer would be looking for. The deck is cast aluminum. Electric start and blade clutch is also available, if desired. The deck, like all Lawnboy mowers, is the 3 in 1 design. The rear drive self propel is variable speed or Sens-A -Speed. Most customers that purchase a Lawnboy mower buy another in the future, based on high satisfaction.